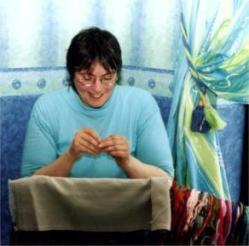 "We want to feature assisi embroidery in the next issue. But can you be a bit creative?" 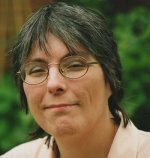 the editor asked me. "Something modern, but based on the traditional Italian technique." As Classic Stitches was a Scottish magazine, I immediately thought of Scottish Terriers. Then Westies. A white dog surrounded by black stitching satisfied the traditional aspect of Assisi embroidery. To give it a modern twist, I decided to stitch the black dog and leave the background void. Surrounding the design with a reversible border enclosed the unstitched white space. I wanted to push the boundaries further, so chose to use blackwork instead of the usual cross stitch. Delighted with the finished design, the editor commissioned a companion cat piece. Later, I also created the third picture, after my Uncle in Australia told me about black swans. These 3 designs are available below, to download and stitch for yourself. 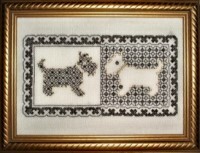 This was the original published design, featuring two Scottish breeds of terrier. The addition of gold thread for the outlines of the dogs adds a little something special. 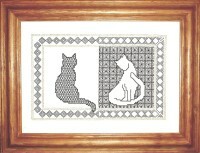 It uses cross stitch for the counterchange border and two simple blackwork patterns. The photograph shows it framed. It also makes a wonderful needle case when lined and folded down the center. There is a lot of counterchange going on in this design. Not only are the cats a different color, but they are facing opposite directions. The border uses a blackwork pattern here, again reversing at the center. A simple line of gold finishes the edge. Although a little larger than the dog design, you can also make this finished project into a needle case. Perfect for yourself or a cat loving stitcher friend. The black swan has to be my favorite water bird. They are so striking! I couldn't resist adding a third design, featuring them, to this range of modern assisi embroidery. I wanted to try something different for the border this time. You will find this simple form of pattern darning fun to complete, using just running stitch. There is no gold thread used in this design, although you could give your swans golden beaks.